Ever wanted to get rid of the low resolution starfields seen throughout the game? Here you go! 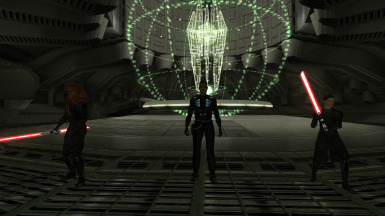 This mod replaces the Force Drain, Force Lightning, Death Field, cold ray, ion, and neural pacifier beam effects with higher resolution versions. Adds custom Revan items (with history description). ALL upgradeable. 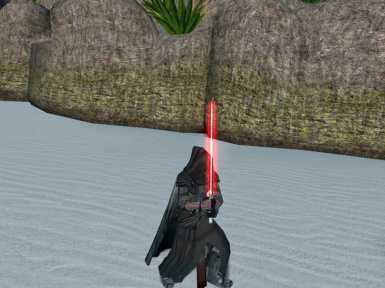 Revan's Mask/Hood Robes, Lightsaber, Double Saber + 3 optional set locations. This mod gives a new look to Taris and Dantooine estate modules. 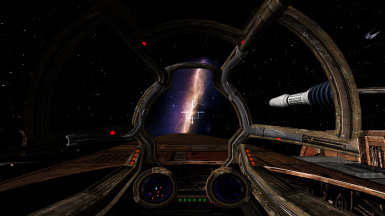 This mod places the planets to roughly their canonical positions on the galaxy map. 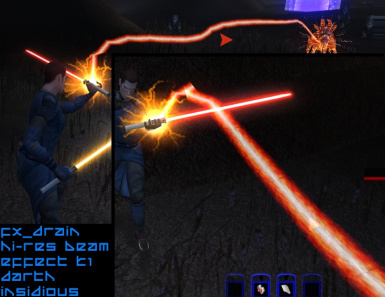 This mod adds 10 lightsaber forms and four force forms to the game, which can be learned at various levels. 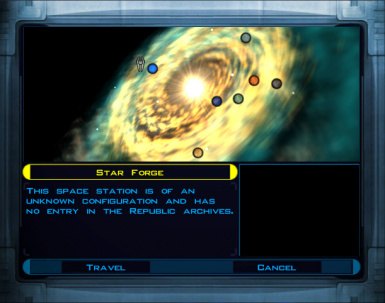 These can be learned from four holocrons and one new NPC, on Dantooine, Kashyyyk, Korriban and the Unknown World. The player can learn a total of seven forms. 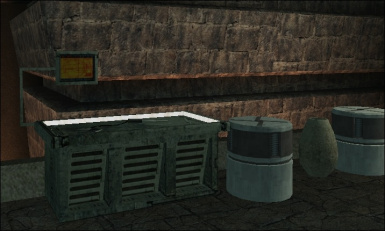 This mod also replaces the icons for the two holocrons Bioware put in the game. 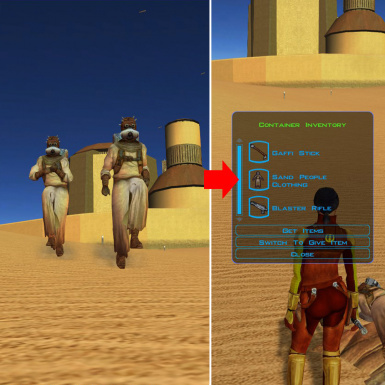 This mod makes the random sandpeople ambushers drop Sandpeople Disguises as in the XBox version of the game, so that you no longer have to attack the sandpeople guarding the entrance to their territory. 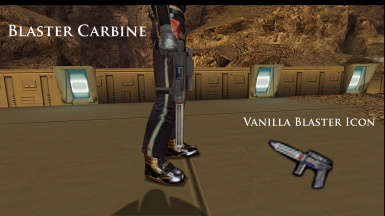 A little while ago it struck me - The Dantooine Jedi academy has a workbench, but the Korriban Academy didn't, which can be very inconvenient. In fact, there wasn't one on all Korriban. This mod fixes all that! Now there is a workbench in the little room which leads to the Valley of the Dark Lords. Two new variants of the popular PHMC01 head (caucasian head 1). 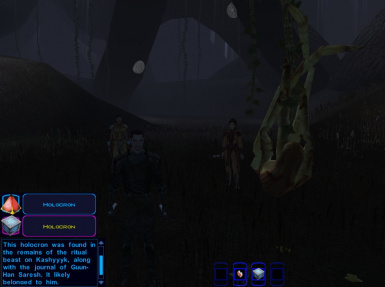 This mod replaces the generic Sith apprentices you meet instead of Bastila on the Starforge if you choose the dark side. Now they have (more or less) unique appearances and each one of them has a unique name. This set includes custom Armor & a new model of Shortsaber. Stylized after Xia Terashai's history, these items are geared towards stealth and scoundrel type abilities. This mod also includes RedHawke's Bastila Clothes for the PC mod. 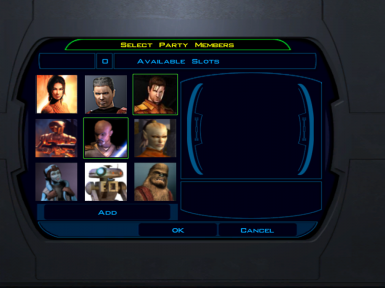 This mod changes each of your party member's portraits (except Canderous and Trask) to different images. If you're tired of the default portraits and looking for something new, this is the mod for you. 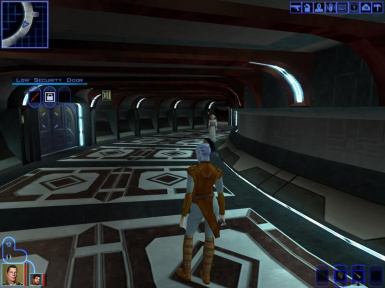 New transition scripts to remove random fighter attacks in KotOR 1. Will not affect any story related events (such as when leaving Taris, for example). 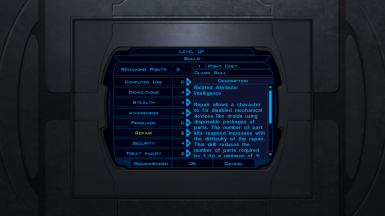 Swaps the Class Skills for the Jedi Sentinel and Jedi Consular, giving the Sentinel the Computer Use, Demolitions and Repair Class skills, and removing them from the Consular. A small mod that improves the end of the Juhani romance by adding a kiss. 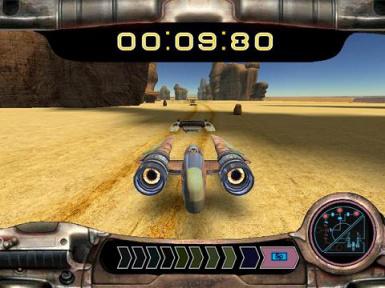 My first ever Kotor mod from early 2004 when I was known as Darth333 on LucasForums, I hated swoop racing with a passion (I had a bad pc too)...this mod turns swoop racing course in a straight line. Just go straight and change gears when the shift indicator turns red. 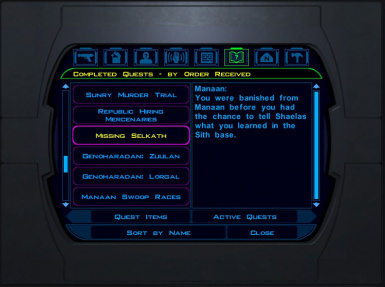 If you've ever played the dark path on Manaan without finishing all side quests before you might have noticed that while you can no longer complete them, they stay in your journal forever. This mod fixes that and ends them properly. A completely custom-made replica of the N7 Valiant weapon from Mass Effect 3.